I’ve been working pretty solidly in the studio lately. these aren’t the absolute latest pics, but they’re a good place to start. It has been so good to have a place to do ‘stuff’. 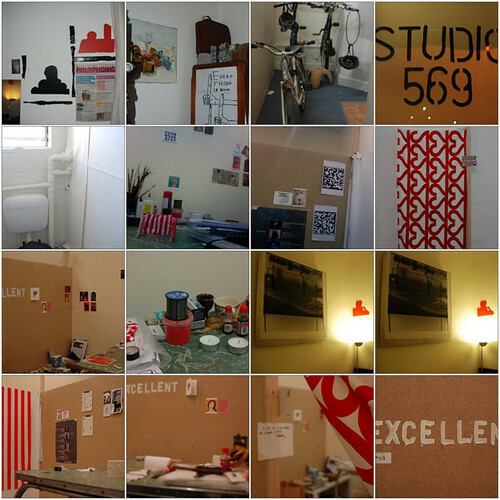 i have stuff on the walls, i have been able to separate the three aspects of my projects into three separate walls (that’s my compartmentalised urban mode of existence, rob and john): toilets, stripes and paste-ups. it’s a bit dangerous having a studio ‘cos i get stuck in what i call the Rage syndrome.. “i’ll just watch one more film clip” or “i’ll just cut one more bit of claridges”, but i also do work there, leave it behind and go home to sleep. i’m not always in my room doing work of some kind. Next PostNext standardisation of measurement in fashion.